A great post from the Federal Reserve Bank of San Francisco blog (https://www.frbsf.org/economic-research/publications/economic-letter/2019/january/how-much-do-we-spend-on-imports/) showing estimates for total imports content of the U.S. household consumption, with a break down of imports content across domestic value additive activities and foreign activities. 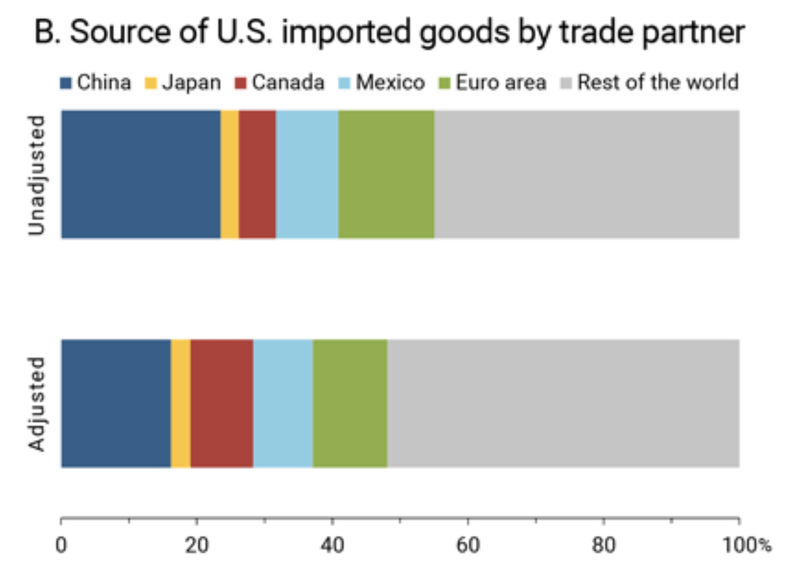 Key results: “Our estimates show that nearly half the amount spent on goods and services made abroad stays in the United States, paying for the local component of the retail price of these goods. At the same time, imports of intermediate inputs make up about 5% of the cost of production of U.S. goods and services. 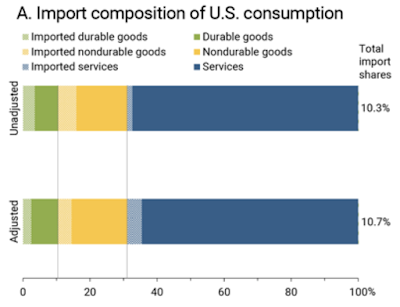 Overall, about 11% of U.S. consumer spending can be traced to imported goods. This ratio has remained nearly unchanged in the past 15 years”. Note: Top bars in both panels are computed directly from PCE and headline trade data. Bottom bars in both panels reflect authors’ adjustments to account for imported content of U.S. goods and U.S. content of imported goods. The above shows that imports play far lesser role in the U.S. households' consumption than popular media and public opinion tend to believe. This, in part, explains why Trump tariffs war with China has had a very limited adverse impact on domestic demand in the U.S.